COCOA BEACH, Florida - A power outage along State Road A1A (Atlantic Avenue) south of State Road 520 (Cocoa Beach Causeway) has snarled traffic in Cocoa Beach, Florida on Tuesday afternoon. According to FPL, most of the power outage has been restored by 5 p.m. However, over 100 customers remain without power which includes CVS and Walgreen's pharmacies. The power outage was reported just before 4 p.m. and FPL estimates that power will be restored to the remaining customers by 9:45 p.m. 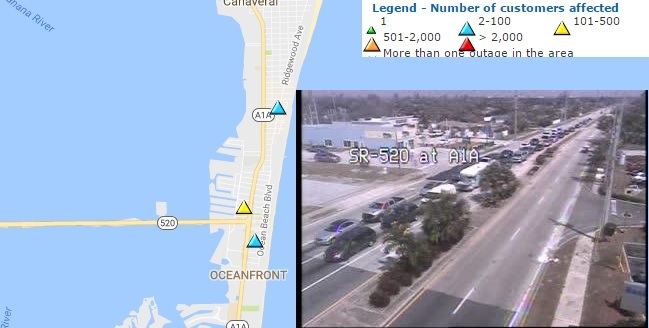 The power outage has also affected traffic lights at a time when Spring Break tourists are leaving the beaches and local area schools are letting out their students, which has resulted in traffic backups all along State Road A1A. Cocoa Beach police responded to the scene to assist in relieving the traffic congestion.